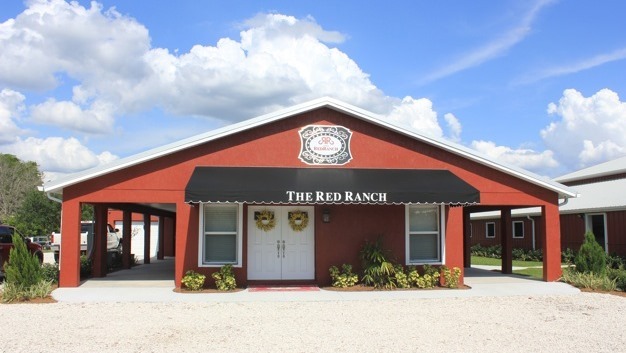 The Red Ranch in Tampa, FL is surrounded by 7 acres of lush farmland, conveniently located near the heart of Westchase. Brad and Kristen Spoor built The Red Ranch with the idea of having a place where their children could go to get away from hustle and bustle of city life. A place where they could get back to nature, enjoy the outdoors, learn about animals, and breathe fresh air under an open and vast blue sky. The Red Ranch is a place for children and families to experience the simple and important things in life. The Red Ranch features a ten stall barn as well as a four stall petting zoo area. There is a spacious indoor space with a simple kitchen, bathroom, living area with a big screen tv and a separate area that's ideal as a classroom, for arts and crafts, and for parties. Cable and free WiFi included. At The Red Ranch you can interact with and learn about a variety of different farm animals including horses, pigs, chickens, ducks, guinea pigs, goats. They offer horseback riding lessons, as well as a store where you can buy farm fresh eggs and other items such as custom shirts, bags and hats. Towards the back of the property, there is a huge bonfire pit- Perfect for keeping warm on those cool Florida nights, roasting marshmellows, or sitting around and telling ghost stories. Contact us today to schedule a tour and see all that The Red Ranch has to offer! The Red Ranch store is now open for business! Currently by appointment only- Please call 866.888.7131 to schedule a girls trip or a visit to the store. Come by to get your fresh eggs for the week, as well as other items such as picture frames, candles, custom shirts, hats, bags, pillows and more.